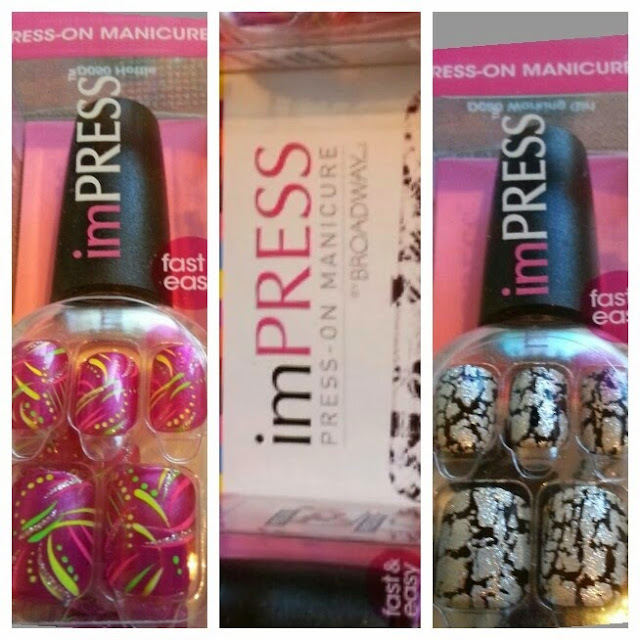 I received two packs of imPress press on nails by Broadway Nails from Influenster in my voxbox. I was soo excited to try these because I have heard nothing but great things. Some friends I know have tried them and loved them. I also loved getting acrylics/gel nail sets from the salon, but I hated how damaging it is to my nails, and how long it takes my nails to go back to normal. After removing the salon nails, sometimes my natural nails would hurt, and just look plain ugly. And the ridges they left behind, yuck! Seeing that these press on nails wouldn't cause damage to my natural nail, I couldn't resist! The imPress nails are very easy to apply. All you do is peel the back off the nail, which already has an adhesive on it, then apply it to your nail. It takes seconds! No waiting time for nails to dry, or cure! Amazing! What's also great is that these nails lasted me a week. Which is very impressive for stick on nails. I've even had acrylics done by the salon begin to lift in a few days, and those were more expensive and applied by a tech! I also love the wide variety of colour and designs imPress has! You want pink nails, you got 'em. Zebra print? They have that too! The selection is awesome! I would definitely recommend these to everyone who is interested in press on nails, who don't want to spend an arm and a leg at a salon, or who doesn't have hours to wait. The price is amazing, and selection is great. I will definitely be purchasing these in the future in a variety of colours! Thank you voxbox (and broadway nails) for sending me this for free, and getting a chance to try a great product! If you are interested in joining influenster, let me know and I can email you a referral link. It's free to join!